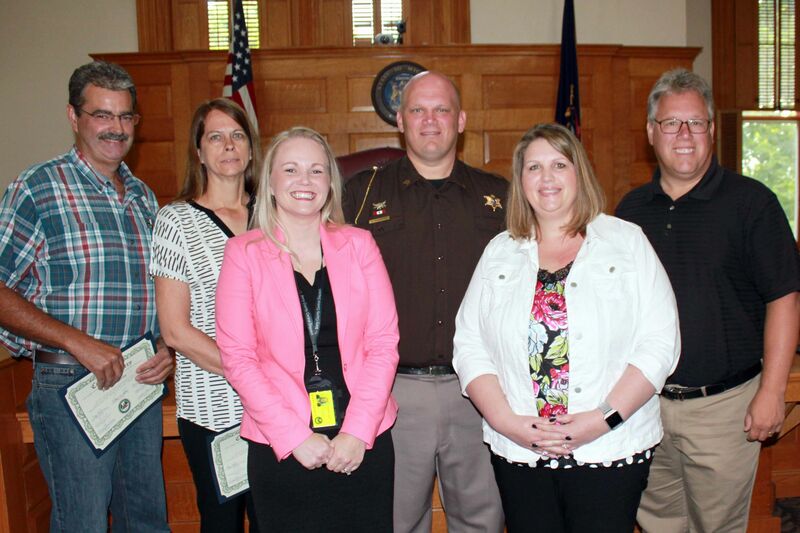 Six employees of Barry County were presented with Barry County Employee Service Awards Tuesday. Introduced by their department heads, all employees were credited for being outstanding employees, with many attributes that made them valuable to the county. *Kent VanBuren makes minor home repairs for the community and handles custodial duties at the COA. The five year employee of the county, he was credited for being hard working and caring by Executive Director Tammy Pennington. *Deputy Rich Frazer, night supervisor at the Barry County Sheriff’s Office, contributes in a multitude of ways, leading by example and dedicated in his five years with the office, said Undersheriff Matt Houchlei. *Cindy Miller, a five-year employee of the county. Now in the treasurer’s office, she has been deputy treasurer for two years. Miller has a good work ethic and is dedicated and smart, Treasurer Susan VandeCar said. *Stephanie Lehman, 10-year employee of Barry Central Dispatch 911 and now its director, is credited by Lani Forbes, chairperson of the 911 Administrative Board, for going above and beyond in her duties, being positive, engaging and trustworthy. *Sarah VanDenburg in the clerk’s office, handles circuit court cases, documents, filing and preparing reports and is known as the problem solver on hard cases. She is knowledgeable and detail oriented, Clerk Pam Palmer said. She is a 10-year employee. *Jim McManus, planning and zoning director, treats people with respect, is dedicated, personable, respected and lends knowledge to any other department that needs it, County Administrator Michael Brown said. McManus has been with the county for 25 years. Photo: Barry County Service Award winners are (left to right) Kent VanBuren, Cindy Miller, Stephanie Lehman, Rich Frazer, Sarah VanDenburg and Jim McManus.